Personal: Resides in Puyallup, Wash…Describes himself in three words as “a nice guy”…First job was as a car mechanic…Lists Walter Ray Williams Jr. as his toughest opponent…Retired from the Air Force after 20 years of service…Favorite sports team is the Oakland Raiders. 2017: Finished ninth in FireLake PBA Tournament of Champions. 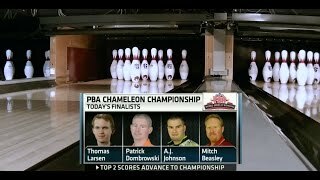 Career: Won 2016 PBA Chameleon Championship for first PBA Tour title after 22 as a PBA member by defeating AJ Johnson 246-237 in title match...Finished second in FireLake PBA Tournament of Champions losing to Jesper Svensson in title match 226-177...Highest previous finish in a PBA Tour event was sixth in the 2001 PBA Greater Nashville Open…Named the 2005-06 PBA Southwest Region Player of the Year…Owns 18 career PBA Regional titles…Has won at least two titles in five different PBA regions. 2016 - PBA Chameleon Championship, Las Vegas.